Cherries and cream combine for a totally indulgent scent. Long-burning soy candle is richly infused with this temptingly fruity fragrance, giving your surroundings a sensory sweet treat! 7.3 oz. 45 hours burn time. Lead free wick. Made in USA. Weight 0.8 lb. Soy blend wax with glass lidded jar. 2 3/4" diameter x 3 1/2" high. 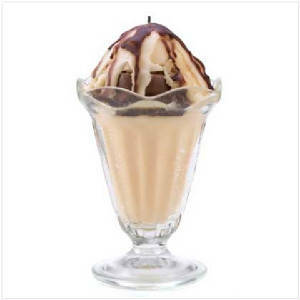 Soda fountain sundaes are everyone’s favorite; this temptingly scented 7.6 oz. jar candle is fat-free fun! Looks and smells just like a sky-high vanilla sundae with all the trimmings, right down to the serving glass. 40 hours burn time. Weight 1.2 lbs. Paraffin wax; glass container. 4" x 3 5/8" x 6" high. 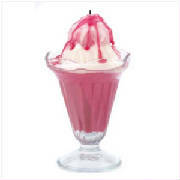 The scent of plump strawberries and strawberry ice cream bring to mind the pure pleasure of a decadent treat. Let this luscious 7.6 oz. jar candle bring a little childhood happiness into any ordinary day! 40 hours burn time. Weight 1.2 lbs. Paraffin wax; glass container. 4" x 3 5/8" x 6" high.